S&S Productions outfits front of house, monitors and broadcast positions with dLive consoles and a DM64 stage box with DX32 and DX168 expanders. 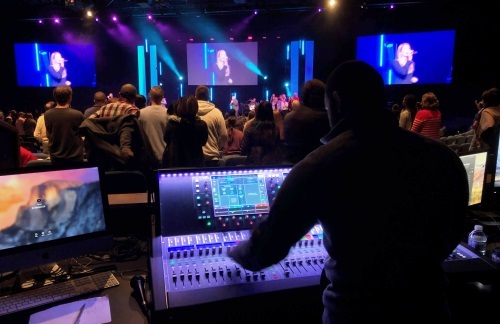 Now outfitted with a pair of Allen & Heath dLive S7000 mixing systems at front of house and onstage for monitors, plus an S5000 standing-in for broadcast needs, Wave Church’s Great Neck Campus in Virginia Beach, Virginia, recently completed a major audio upgrade. Engineered and implemented by Virginia Beach-based S&S Productions, the system improvements bring new levels of control and flexibility to the campus. The 12-inch capacitive touchscreens on the dLive control surfaces feature dedicated “widget” areas that can be set up to keep track of scenes, meters, FX, and other user-created control functions. Scenes are widely used at the Great Neck campus by all system operators, including Sprenkle, a member of the church himself. 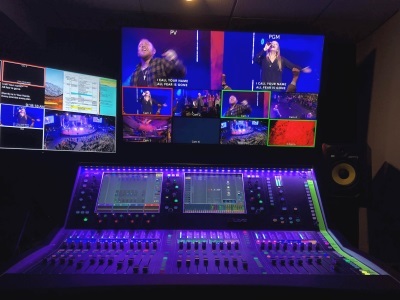 There were other benefits too, including the ability to monitor and control the church’s Shure wireless microphone systems directly from the dLive interfaces or via a laptop computer using Allen & Heath dLive Director software. With 64 buses available at each control surface, stereo mixes became a routine reality in both the house and onstage, where over 14 IEM mixes were created. Networking capabilities were expanded with the use of Waves, Dante, and AES I/O cards, the latter of which were used to carry digital input to the system amplifiers. As a safeguarding measure, each of the new dLive mixing systems is equipped with dual redundant, hot-swappable power supplies.